Confusion on a subject starts when we start to confuse terms and use them interchangeably with each other. I have been as guilty of this as anyone in the past and much like I did with my Cardio vs. Endurance article, I feel I need to clarify my points on something, namely the use of road riding for mountain biking. For most riders Road Riding = Riding a Road Bike on the Road. However, this isn’t the case and you can ride on the road without throwing a leg over a road bike. If you threw some micro-knobby or semi-slick tires on your mountain bike and went out for a cardio workout ride on the road then you are Road Riding, but not in the way that most riders would think of. And that is the point – by forgetting that Road Riding can be done on a mountain bike as well we miss out on a chance to make better use of it. I am actually a big fan of road riding for cardio workout rides – there are so many variables on a trail that it can be tough to do the workout as it was intended and to replicate your efforts the next time you do the workout. On the road you don’t have to worry about as much as you can just get down to business, plus it is much easier to compare workouts from a road ride than a trail ride. However, I don’t like to have riders use a road bike for those workouts. There is not law that says you have to be on a road bike when road riding and to be honest with you I am not sure why a mountain biker would want to. Remember that you are not trying to improve your aerobic fitness for its own sake – you want to improve its ability to fuel a very specific type of movement effort. I’ve often wondered were the logic behind riding a super light bike in off season training came from. I would think that if you rode a bike that was at least as heavy, if not maybe a bit heavier, than the bike you ride trail on then you would get much more out of it. I think that this is one of the main reasons that riders feel that hours and hours on a road bike just don’t translate like they should to the trail – what good is a being able to power a 20 pound road bike when your mountain bike is significantly heavier? The point is that you can do any cardio workout you need to on your mountain bike and the more specific body position and weight of the bike will result in better transfer of your improved cardio conditioning to the trail. Road Riding can be a very valuable part of your training program but only if you understand how to separate the road bike itself from the equation and look at the best ways to use it as a mountain biker. Winners of the new UMWP v5 with Enduro, XC and DH Specific versions. Coach â€¦I found your article on road riding as a mountain biker very interesting. In my riding area road riding can be extremely dangerous. We just do not have enough automobile operators that know how to share the road with bicycles. In the woods, the deer, bear and turkey do a much better job. I have found however urban riding (riding within small municipalities) using a rigid single speed mountain bike to greatly increase my stamina, balance, and over all conditioning. Finally! Some affirmation for what I’ve always felt. I can’t tell you the flak I catch for riding my mountain bike on the road. My friends plan a road ride and I show up with my mountain bike–I get some strange looks. What would be a casual, easy ride on a road bike turns into a hard, aerobic workout on my mountain bike. And its so much easier to do an interval workout on the road where the variables can be more easily controlled. Thanks for the article! p.s. I have noticed a switch in my riding: I used to do 95% sitting and maybe 5% standing. I’m not to about 65% sitting and 35% standing-sometimes I stand more. The standing position is starting to feel more natural than sitting . . . I do both road and mountain biking, with the later being my main focus. I can tell you from experience that the road riders are probably looking at you with strange looks only because now they cannot go as fast as they want since they have to wait for the person who brought the slow mountain bike. That is all your athletic abilities are comparable. I know that I started showing up with my mtb on my wife’s road rides only to find out that the group wanted to go much faster than I was capable of on my mtb bike. I do have to agree with you second post though. Riding the road definitely improves pedal stroke and the ability to stand while climbing. Here’s hoping your road crew is more understanding than mine was. Great article and just what I’ve been thinking in preparation for the multi stage MTB race I’m doing next March. I’m sure someone said that you need to ride the bike you’re going to be racing on? It’s not just the weight, my road bike (on the rare occasion i ride it) has a different feel and response. Here in Southern California most people do both. We don’t pigeon hole ourselves in one category or the other. We ride both, and we race both to some degree of success. So I have to disagree with you on this one. I totally agree with you on the quote:”mountain biking is not road cycling in the dirt.” But to think they are not effective cross training tools is narrow minded at best. Here are some of my points. 1.Bike weight doesn’t matter so we can throw that one out the window. It doesn’t matter if the bike is 15lbs. or 25lbs. If the rider can only push 200 watts at threshold or his given Critical Power at what ever time is specified. So that’s all he or she can do. People will make the same power regardless of weight only speed will change. 2. It’s easier to recover from day to day road riding. So if I’m focusing on endurance, and training the body to use more fat and less sugar. Then a I can go back to back on long easy rides while staying in a steady state much easier. 3. Group rides- just like mtb helps with balance. Extremely fast road rides can help with balance, focus, drafting tactics(yes, I draft on the mtb a lot racing single speed). Try riding 28mph elbow to elbow, wheel to wheel, fighting for position, while at your max heart rate in your underwear. Then tell me it doesn’t take focus and speed skills to stay off the pavement. This can’t translate and give you an edge? 4. Crit races mimic a anaerobic interval session as close to racing my single speed than anything I can think of. I can also think of even more ways the mtb helps in my road racing. So if mtb can help road than why can’t the road help mtb. They really do compliment each other if you do it right and set your bike up right. I’m not saying you need to go out and buy a road bike if you don’t have one. I’m just saying it can help and break up the monotony of doing one thing all the time. Make sure crank length, saddle height and set-back is identical on both bikes. I never thought resistance training was so important in cycling. But you proved me wrong. One day I was looking for answers and came across your web site. Ordered your ultimate package and crushed the guys who were beating me last year. I WAS WRONG! 1 – I don’t know that I can agree that bike weight doesn’t matter. Producing 200 watts on a 15 pound bike takes less tension than doing it on a 25 pound bike and it is the ability to produce and sustain a particular type of tension that you are ultimately trying to train. Wattage is a symptom of something, not a direct cause, and not all power production is the same. You can turn a smaller gear faster or you can crank a harder gear at the same RPM – both will show up as more power but the specific adaptations will be very different. Same with the weight of the bike – producing 200 watts on a bike that weighs 10 pounds more is accomplished via different specific tension production skills and this does matter. If you look at training from a tension production and management viewpoint and remember that numbers in training are symptoms of the types of tension production you train then you have to account for the types of tension as well as the raw output numbers. I could be totally off here but instinctively I know that a heavier bike feels “harder”, not just “slower”. 2 – You can do a recovery ride on a mountain bike just as easily as a road bike. 3 – A good rider will be able to draw lessons and learn from a wide variety of sporting endeavors and road bike racing is one of them. However, this again is different than riding a road bike on the road for the specific purpose of improving your mountain biking fitness. Seriously, though, I think you might be missing my point a bit. If you are going to race road bikes and train for that (or ride with those that do) then you will get some side benefits. However, if you are going to ride on the road to improve your mountain biking I would argue that you are better off using your mountain bike. Like clipless pedals, a lot of riders are told they “need” to buy a road bike and get out on it to improve their trail riding and I’m just trying to point out that it not true and you don’t have to ride a road bike to gain the benefits of some time spent road riding. On this no-one can disagree. I would always argue that mountain biking helps road riding more that road riding helps mountain biking. I agree with Heith. Here, in my country, elite riders train from Monday to Friday on Road Bikes and on weekends they go to trails or compete on mountain bike events, local and national events. And it is amazing how fast they go on both bikes. I recently bought a road bike for my birthday and i can say i have improved in every aspect of MTB. Endurance, speed, force, confidence, focus and more. The only aspect that maybe hard to train on a road bike is technic or cornering. I found that this is a limiter, but i go to train has much as i can on weekends on trails that are technicaly difficult. My training system is to ride Road Bikes from Monday to Friday and on weekends i go to trails with my MTB. Off course i am a follower of this page and i recently bought the No gym, No problem book online and i have seem excelent results. So i believe that having a structured training plan including both bikes and a stregnth training system (like this one) is the key for riding faster and stronger. Don’t confuse what a great rider does with what an average rider needs to do to improve. Most trail riders need a lot more than just improved pedaling – skills and strength also play a huge role. Unless you have the 4 hours a day to train that those guys do you can’t read too much into what you see them do. With that said I don’t want this to get taken the wrong way – I am not saying you won’t get any benefit from adding some road bike riding into yoru routine, simply that you don’t have to in order to improve and, if you don’t particularly want to ride a road bike, you can get the benefits of road riding without one. Yes, 200w at a lower cadence would require more torque/tension. I do not disagree with you. But that is where gears come in. If ones self selected gearing is around 80rpm then they will usually shift to accommodate that. That being the case, 200w at 80rpm is 200w at 80rpm regardless of bike weight. If you want to increase torque/tension within a specific workout, simply shift into a harder gear. Point 5 convenience: some people don’t live next to desert or wooded areas that are easily accessible to mtb. It’s much easier to get home after work, grab the road bike, and head out the front door to get that work out in or just get out and ride. Rather than drive to a ride spot. You are correct in the end result but getting a heavier bike up to 200 watts at 80 rpm takes more tension and a different type of energy than it does on a lighter bike so every time you have to slow down and re-accelerate you are missing out on a chance to train your body to perform that task with the heavier bike. On the trail it isn’t the ability to sit and spin 200 watts at 80 rpm that is holding most riders back, it is the constant slowing down, coasting and accelerating that is wearing them out. From a tension production and management viewpoint road riding and trail riding are completely different tasks and little stuff like the effort it takes to accelerate up to your target wattage and rpms matter. You like to ride a road bike and have benefited from it – I’m not trying to argue that point. However, I will argue that you don’t need to ride a road bike to train for mountain biking and that, from a pure specificity standpoint, training on one isn’t as good as training on a mountain bike. You will get a lot of benefits from training on a road bike but that won’t be as 100% applicable as what you’ll get on a mountain bike. I recently completed the BCBR and used a Surly Pugsley FatBike with 4″ Black Floyd road tires for my road training. The pug weighs in slightly heavier then my mountain bike and is a hell of a lot more comfortable then a road bike. I find that a road bike rattles your teeth while the pug is like floating down the road on pillows. The miles were harder to earn but I think they were far more comparable to off road miles. If you have the means I highly recommend picking one up. As an added plus with the normal off road tires you have another great bike in your stable. The Pug is an interesting idea…kinda makes me wish I had bought one instead of a used road bike. I definitely get the point that riding an mtb on the road is better mtb training than riding a road bike and that if an mtber doesn’t have a road bike getting some slicks is a great solution, but the main reason I’d rather use a road bike for road riding is that I think it’s way more fun. If I’m forced to ride on the road (bc of time issues or crappy trail conditions) I think it’s way more fun to be able to cover more ground/explore more, go faster, or challenge myself trying to stick with roadies on a group ride, than to go way slower on an mtb w/ slicks wishing I was using it on the trail. I understand the gains are probably less, but I think the fun tradeoff (and the associated higher likelihood that I’ll ride) are worth it. The fat-bike point is interesting though, I could see that being really fun. Sometimes it’s fun to go fast… on the road… on a light bike. I’s also fun to go fast, down a hill, on a not so light mountain bike. Sometimes it’s hard to know how best to train to get the most bang for your buck. I think that my time on the mountain bike improves my experience on the road bike. I can not say that it’s true the other way around. I’ve always thought that was weird. If I’m not able to get to the trail that often, then road riding fills the void. Back when I rode more on the trail, then doing intervals on the road helped me out tremendously. So, it fills the void if folks just want to ride. I would have to agree with Tim. For me riding a road bike is about the fun factor. Getting out on my 14lb road bike and blowing by all the roadies that don’t ride MB. Hey Bryce, I did BCBR too. Congrats, you rocked that race! So, I am almost ashamed to admit it but, I took a compu-trainer class in January and Feb. this year. At the same time I was a couple months deep into really dedicated work on one of your strength training programs. I have been using your strength training programs for several years now and really see the benefit. I have never cared to even know how many watts I put out and the last thing I want to do is hook up my wheel up to a computer when I get in from a ride to “figure how well i rode”. I never bought into the whole watts training thing what so ever, but as painful as it is for me to admit it, a training program based on watts, is spot on for pushing you just hard enough to get stronger, but not so far that you can’t go again the next day. I think this is very much inline with your programs. 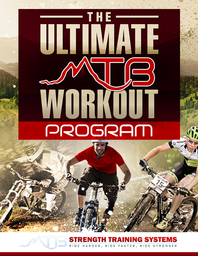 In tandem, both of these programs made me stronger than ever on the trail, but i could only handle the mental side of the compu-trainer program for a couple of months and when daylight came back, I was happy to be outside on the moutain bike. Not sure if I will do the compu-trainer thing again this year, but I will keep up with the strength training. Fact is the strength training helps with most anything I do. The spinning is highly specialized, but worked for me. You guys do realise that James is not saying don’t ride on the road. He is saying if you ride on the road use your mountain bike.. Trail access has nothing to do with what bike to ride. First of all I am a big fan of this website as it helped me ponder many of my choices and change my workouts. But getting down to the point. I just wanted to make one point clear that I personally, as a 16 year old do not have the money for a second set of tires just to ride my mtb bike on the road. But I also don’t have a road bike. I ride a 15 year old “mountain bike” as my road bike(a cheap hard tail from Sears). IT is significantly heavier than my Santa Cruz Butcher and the extra weight during interval training and endurance rides really helped me get my fitness level up for my first race. Yet what I find was the most helpful was my decision to buy a faster set of tires before the race. I previously rode Maxxis Minions Super Tacky(a great tire just slow for trail standards). I did all my training on those tires and about a week before the race switched to a Mountain King(front), Xking(rear) setup. (Switching tires that soon to a race a terrible idea, don’t follow suit, although it worked for me). If you are accustomed to those faster tires I think it is a smart idea. By buddy that I trained with and raced with all of a sudden was getting lost in the dust as I sped ahead of him because of the lack of a much larger resistance. Well either way that is my little experience. I’m just saying this worked for me and might not work for everybody. And conclusively, once again, love this website. Actually there is no law that you can’t ride a mountain bike on road. But a bike with slimmer wheels may always perform better on a flat surface than mountain bike. Slightly off topic, but what do you think of trail running as an offseason way to train for mountain biking? To me trail running feels very similar to mountain biking. there is a lot of acceleration and deceleration, spikes in heart rate as you struggle up steep pitches, and it feels like there is a great deal of tension and torque generated by your legs during steep sections. I live in a dark rainy climate, and trail running is often the best alternative during the middle of the dark soaking wet winter. I love to use running in my program and did a podcast that you can check out on it by clicking here.